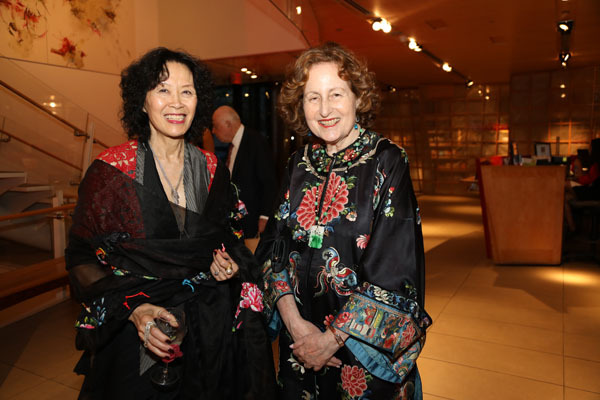 The Tang Dynasty Ball, co-chaired by Agnes Hsu-Tang and Oscar Tang, coincided with The Asia Society’s opening of the groundbreaking exhibition “Secrets of the Sea: A Tang Shipwreck and Early Trade in Asia” on view through June 4, 2017. Guests were treated to music by the Siong Leng Musical Association, their first-ever performance in the United States. Then they followed a traditional Tang Dynasty procession from cocktails into dinner where the five-course meal followed the itinerary of the sunken ship: a first course from northern China, followed by Vietnamese rolls, the entrée from India, and special Middle Eastern desserts. Betsy Z. Cohen and Asia Society VP Tom Nagorski were among the welcoming speakers. Dinner guests then moved downstairs to dancing with the younger committee and Persian desserts in the Garden Court. Betsy and Ed Cohen, Judith-Ann Corrente and Willem Kooyker were the evening’s vice chairs, Carolyn Hsu-Balcer and René Balcer were the evening’s benefactors; friends of the evening included the Arnhold Foundation, J. Frank and Susan Brown, Anne and Joel Ehrenkranz, Charlotte Feng Ford, Susan E. Lynch, Cynthia Hazen Polsky and Leon Polsky, Alexandra Munroe and Robert Rosenkranz, Barbara and Donald Tober, and Lulu and Anthony Wang; guests also included Ann Ziff, HRH Princess Jeet Nabha Khemka, Prince Dimitri of Yugoslavia, ABT’s Hee Seo, actress Phylicia Rashad, Susan Gutfreund, Timothy Fok, and Nancy Moonves.